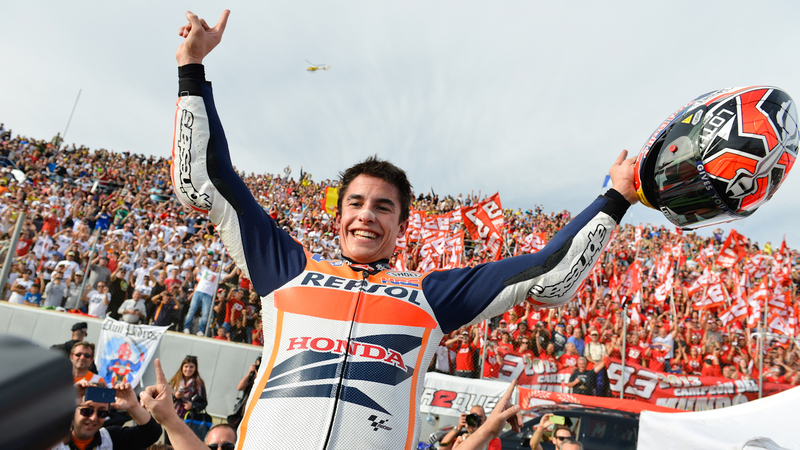 Marc Marquez is the youngest ever rider to clinch the premier class world title in MotoGP™. Thanks to a truly amazing debut season, the 20-year-old from Cervera, Spain also becomes the first rookie premier class World Champion for 35 years. Márquez’s debut World Championship campaign in 2008 immediately served notice of his talent and he took a podium at Donington Park in his first season, despite a shortened campaign due to injury. In 2009 he scored a single podium on his way to eighth overall, before his full talent truly blossomed in 2010 as he scored an incredible ten victories from 12 pole position on his way to the 125 World Championship title. One of his most notable rides was his win from last on the grid in Estoril. Stepping up to Moto2™ in 2011 the youngster got off to a rocky start, crashing out of the first two rounds. However, a first win in Round 4 at Le Mans laid the way for six more victories as he pushed Stefan Bradl closely for the title, until a crash in practice at Sepang ended Marquez’s season prematurely. Problems with his vision as a result of that crash cut short his 2012 pre-season, but he was well on the pace in the final test at Jerez and was therefore an instant favourite for the title. Márquez did not disappoint in 2012, as he took victory in the first Moto2™ race of the season in Qatar and made his intentions clear with some tough and controversial overtakes in the race. A first DNF after a crash at a wet Le Mans gave his rivals hope, as compatriot Pol Espargaro mounted a strong challenge, yet after a coming together of the two at their respective home race in Catalunya – where Espargaró crashed out and Marquez collected valuable points – the title race was strongly skewed in the eventual World Champion’s favour. A total of nine wins – including two which saw him fight his way through the whole pack in Japan and Valencia – and 14 podiums ultimately saw the Spaniard take his maiden Moto2™ title before moving up to the Repsol Honda Team in the MotoGP™ premier class for 2013. 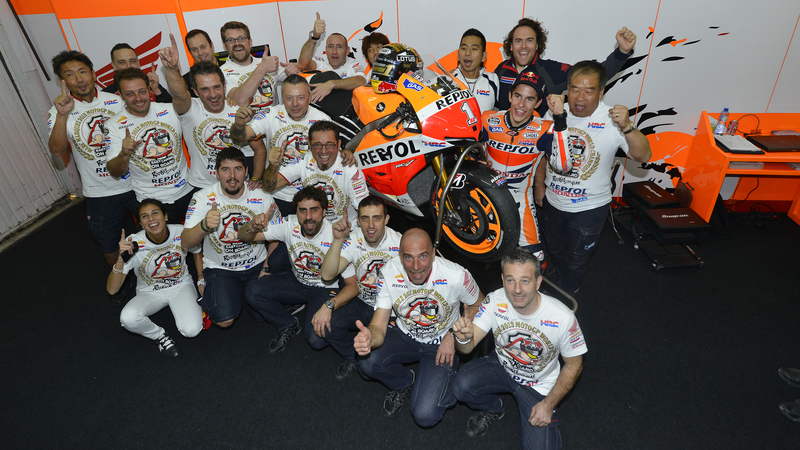 Moving into 2013, Marquez joined the previous season’s runner-up Dani Pedrosa. A remarkable start to the campaign saw him go head-to-head in Qatar with multiple World Champion Valentino Rossi, eventually losing out to the Italian. Despite that, Marquez’s rostrum at Losail would remarkably prove to be his first of 16 across the 18-round season, with the only two blots on his copybook being a crash while running second in the closing stages at Mugello and a disqualification for failing to make a mandatory bike change in time at Phillip Island. At the inaugural Grand Prix of the Americas in Austin, Texas, he phlegmatically achieved his maiden premier class victory from pole position at only the second event of the campaign, in the process taking records away from Freddie Spencer as the youngest ever pole-sitter and race winner in MotoGP™. In Jerez, Marquez made headlines as he collided with reigning World Champion Jorge Lorenzo to grab second place at the final corner, then pulled a memorable pass on Rossi around the outline of Laguna Seca’s world-famous Corkscrew. At Silverstone, he lost out to Lorenzo in a last-lap battle that will go down in MotoGP™ folklore as the pair crossed the finish line just 81 thousandths of a second apart. They would trade paint again at Sepang, as Marquez came out on top for second position to further increase a championship lead he had retaken at July’s German GP following heavy crashes for both Lorenzo and Pedrosa. At both the Sachsenring and Indianapolis, the 20-year-old enjoyed perfect scores of pole position, fastest lap and race victory. He clinched the title in Valencia on 10th November, replacing Spencer as the youngest ever premier class title winner by finishing in third place behind Lorenzo and Pedrosa following a thrilling early-race battle as the outgoing Champion attempted to slow the pace. Marquez therefore becomes the first debutant to clinch the premier class title since Kenny Roberts won in his first season of 1978. In doing so, he also becomes the 26th premier class World Champion in the series, which dates back to 1949. He is the third Spaniard to claim the ultimate honour, after Alex Criville (1999) and Jorge Lorenzo (2010, 2012), and has won the titles of all three classes across just four years. Marquez has finished in the top three 16 times in 2013 – the greatest number of podium finishes ever by a rookie in the premier class. He has qualified on pole position nine times in 2013 – the greatest number of pole positions ever by a rookie in the premier class. At the second race of 2013 he became the youngest ever winner of a premier class Grand Prix race (20 years, 63 days) and the youngest rider to start from pole; Freddie Spencer had held both records since 1982. His points total of 334 is the greatest number of points ever achieved in a rookie season in the premier class.